Detecting Twins With Ultrasound - Is it twins or not? Part 2 of Am I Having Twins? 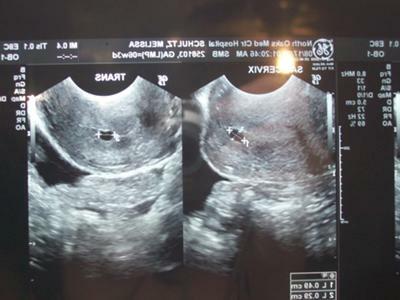 Detecting twins with ultrasound is the best confirmation that you're having two babies. Ultrasound, predictably enough from the name, uses very high frequency sound waves to peek at tissues inside the body that we cannot see with the naked eye. 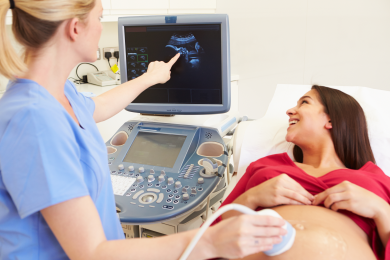 Ultrasound is useful in many situations, not just in monitoring pregnancies, but it is especially used in pregnancy as it does not impart an ionizing radiation dose to the sensitive developing baby. The picture generated by ultrasound reflects the different ways (and amounts) that sound waves reflect (bounce) off of tissues. Ultrasound can show us the difference between bone, such as in the developing skeleton (white-looking), fetal tissue (gray), amniotic fluid (black) to help us look at a growing pregnancy. There are fancy words used in medicine to describe this phenomenon that you may encounter, such as "sonolucent" (looks black), and "echogenicity" (how much sound wave is reflected), and more. They're simply referring to the likely density and structure of the tissue you're seeing as outlined above, so don't be put off. 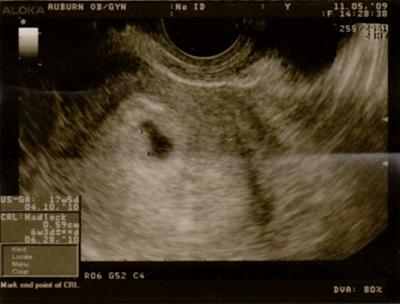 So, with all of this in mind, what do twins look like early in a pregnancy on ultrasound? The simple answer is that it depends a bit on the type of twins, a slightly-unhelpful sounding answer which I shall return to and clarify! 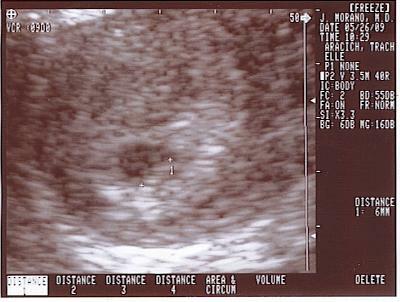 A very early pregnancy in the uterus with a vaginal scan (4-5 weeks) will only show a small black circle. This is known as the gestational sac. At about 5-6 weeks, a tiny structure termed the fetal pole becomes visible, along with a ring-shaped structure called a yolk-sac. At 6 weeks there should be a visible fetus, yolk-sac and the visible flicker of a fetal heartbeat. Returning to how twins would appear, we blather on a lot about something called 'chorionicity'. I've discussed this before (See - Twin Pregnancy Complications) but in brief, twins come in three flavors, depending on the number of membranes (termed chorion and amnion) they share. 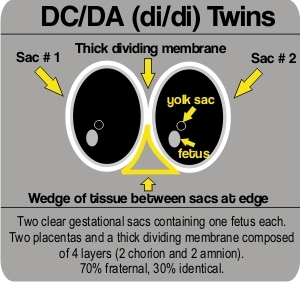 Dichorionic, diamniotic (di/di) twins who share no membranes, are in completely separate sacs and are mostly (70%) fraternal/non-identical, those that are identical have split very early in development. Monochorionic, diamniotic (mo/di) who are identical and have a thinner dividing membrane as they share the layer known as the 'chorion' and are only separated by the amnion. 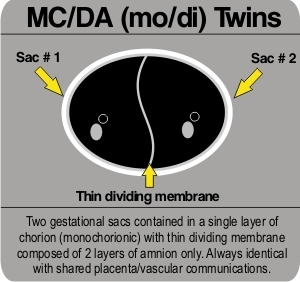 Monochorionic, monoamniotic (mo/mo) who share all the membranes, are identical, and are in the one sac together. The latter are the rarest type of twin pregnancy and also the highest risk. Read about Mo/Mo Twins. 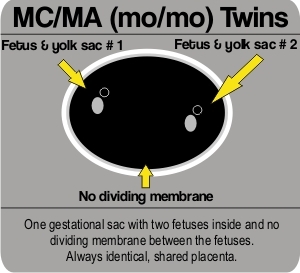 Note that sometimes the dividing membrane can be very fine and hard to see, so twins that LOOK like they might be mo/mo are usually rescanned, examining very hard indeed for the presence of a membrane as the management and risks involved in mo/di pregnancies compared with mo/mo ones are different. Mo/mo are the form of twin pregnancy carrying the highest risk to the babies, as well as the least common. If you have been unlucky enough to see two clear babies at an early scan but now only see ONE, what happened? The usual explanation in this situation is that both scans are accurate and unfortunately one twin has miscarried (as 20% or so of pregnancies do), leaving the remaining twin to develop as a single baby. This is a phenomenon that was recognised to occur more often than thought once early pregnancy scanning became more prevalent and is known as a "vanishing twin". If you first scan is later in pregnancy and your caregiver is not certain about chorionicity (between mo/di and di/di), this is because as pregnancy advances the initially thick dividing membrane in a di/di pregnancy can become thinner looking, hence if the genders of the babies are the same (and there is no first trimester scan to refer back to to answer the question), everybody will have to assume mo/di and monitor you accordingly. The main concern in this situation of of developing a condition known as TTTS (twin-twin transfusion syndrome). Coming to the pictures, now that you've had some twin-spotting practice, have some fun guessing which of these scans contain twins*. # 1) From a single view of a scan, it can sometimes be a little unclear just what you're seeing- that's why we scan in several planes and in real time. The person doing or reviewing the scan at the time will be able to give you better information that from the Internet! 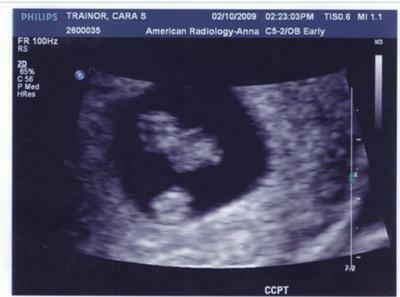 At 6 weeks 5 days, if twins were present, there should be two clear heartbeats on a vaginal scan. As a small aside- this poster asks if identical twins are paternally inherited, to which the answer is a simple 'no'. Identical twins are a random event that is the same across all populations whereas the tendancy to release more than one egg at a time (giving fraternal twins) shows population variation. For this reason a male partner with a family history of twins cannot increase his wife's odds of conceiving fraternal twins. # 2) The bottom round blob in this scan is a structure known as a yolk sac, note how it is not shaped with limb buds like the baby above it. The yolk sac is a structure that exists early in a pregnancy and can be quite large compared to the baby, bearing in mind that BOTH are only millimeters long. # 3) In this scan, given that there is only one sac visualized, it is possible that they are two different views of the one sac. They MAY be two views of different sacs, but without a shot showing BOTH sacs at once, it's very difficult to make the 'twins' call. With a scan this early, before any baby is visible, you are most likely to be asked to return to see if there is a heartbeat by about 6 weeks gestation. # 4) This scan shows a plane throughout the skull and body of one baby who is lying horizontally across the screen. Note how the skull is developing bone and looks white around the outside, the other end is the pelvis and legs. Also, at this point in gestation, it's almost impossible to miss a second baby in there! # 5) This is an early scan on a machine with relatively poor resolution, but it looks like the baby is the measured structure off to the right in the gestational sac. The other pixelated looking grey spots may represent the very edge of the sac in the plane of the scan. Essentially, the resolution is poor and it is only one view. *The correct answer is probably none of the scans show twins. In summary, it's fun to speculate, but remember to check with a health professional before you purchase two of too many things! Good luck, and happy twin-spotting. Geohde is the author of the blog Mission Impossible? She is an M.D. and mother of twins. 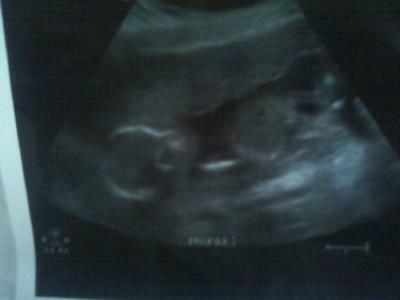 This article on Detecting Twins With Ultrasound is part 2 of her article called Am I Having Twins?